February is the month of love, and it has been no different for Erik and I. Just speaking for myself, I have fallen in love with so many teas this past month. To make matters worse, they aren’t even “my type.” Rooibos and herb & fruit teas have always taken a back seat to my true first love, Assam. However, I must confess I have become quite twitterpated. The herbal tea was February’s Tea of the Month, Be Mine Chocolate Strawberry. This tea is a sensory delight. From the moment I opened the bag, the sweet scent of strawberries and chocolate blossomed around me. Large pink pieces of sliced strawberry amid dark pieces of cocoa are a feast for the eyes, and the brewed infusion is the sweetest shade of pink-red. Lastly, the flavor. *sigh* Wonderful ripe strawberries burst on the tongue and dissipate to a warm chocolate ending. I’ve tried it at various times of the day, and this is the perfect cup of tea to share with a loved one no matter the time. I personally love this tea best when the kids are off being quiet and I can share those deep breaths of chocolate strawberry steam with the man I love. The second tea that has made the “Goodness, how did I ever live without you list” is the Prince Harry and Meghan’s Royal Wedding Blend. Much like the previous tea, this is a beauty to behold. 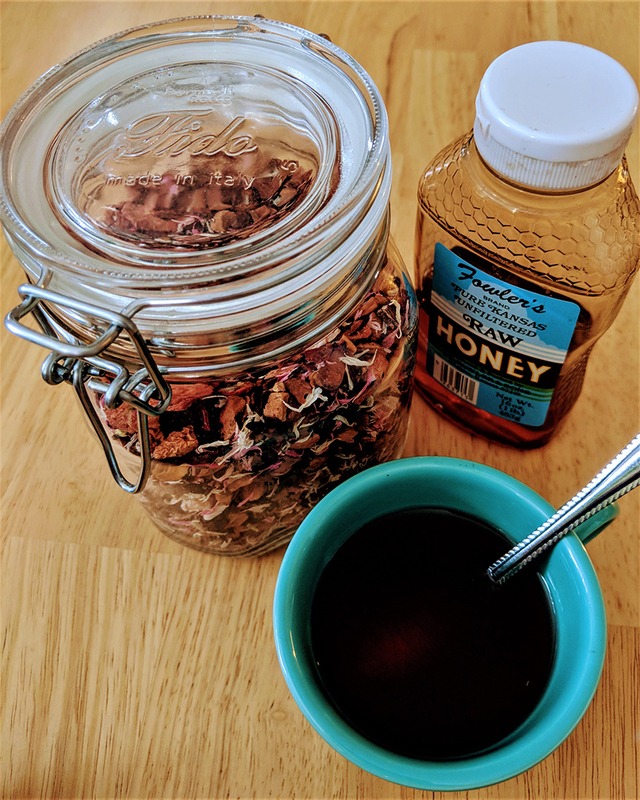 The golden rooibos, pink and red rose buds, and the purple blue of cornflower petals, work together to make this herb and fruit tea beautiful to look at. The scent of this tea is so wonderful it smells like it would taste good straight from the bag. I haven’t yet given in to this urge. I can’t imagine would be as lovely as the smell makes it seem it would be. While this tea does have both black and green teas in it, the flavor is highly affected by the sweet, smooth quality of the Rooibos, that is also a part of this blend. It sweetens this tea effectively enough that it requires only a small amount of your favorite sweetener. For me it’s a local raw honey, but regardless of your choice, you won’t need much. Just nobody tell my, full bodied first love that I’m flirting with these light, sweet lovies and everything should be fine.